January was a busy month for field staff. We started by completing our eelgrass permanent transect monitoring. We were excited to see a few patches of eelgrass along the transect across from Pasadena Point. There were a few patches here in 2017, but none fell on the actual transect. This was the first year since 2010 we found eelgrass along this transect. Small patches of eelgrass across from Pasadena Point in Los Osos. 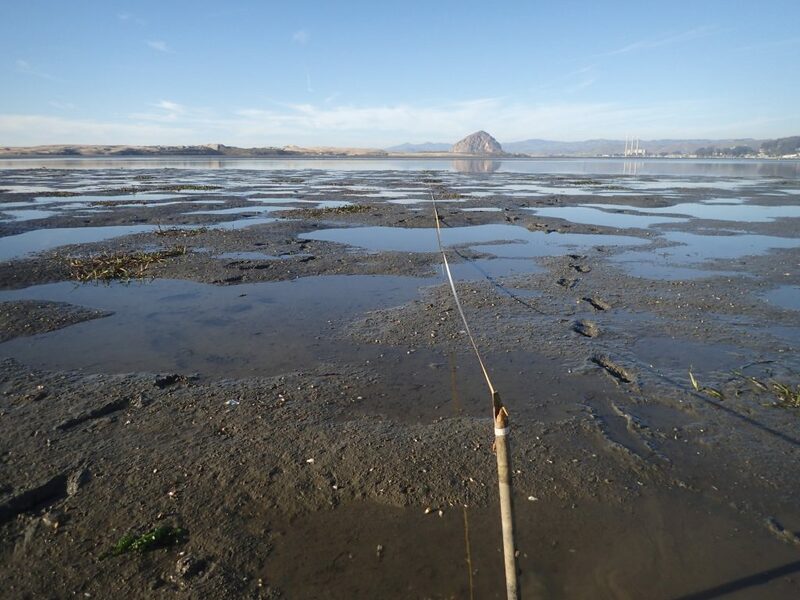 We also scouted sites for our 2019 eelgrass restoration projects, which kicks off this weekend. We are hoping to do a series of three planting efforts across the bay in 2019. Keep an eye out for updates on this effort in future blog posts. To read about past efforts, check out these blog posts. Here is a list of species we spotted in January while out in the bay. We’ve seen the mass pictured on the left many times, but this was the first time we saw the one on the right. We thought they were just bubbles of water at first. We think they are eggs, but aren’t entirely sure. If you know what they are, please get in touch. January was an exciting month for sediment monitoring. 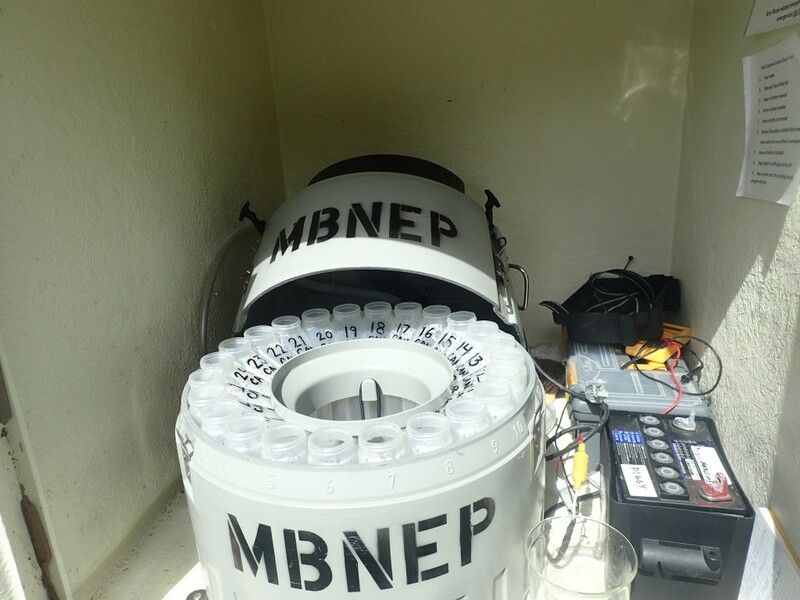 Starting with the rain that came late on Friday, January 11th, we deployed our sediment samplers six times. Check out this blog post to learn more about why we monitor sediment. 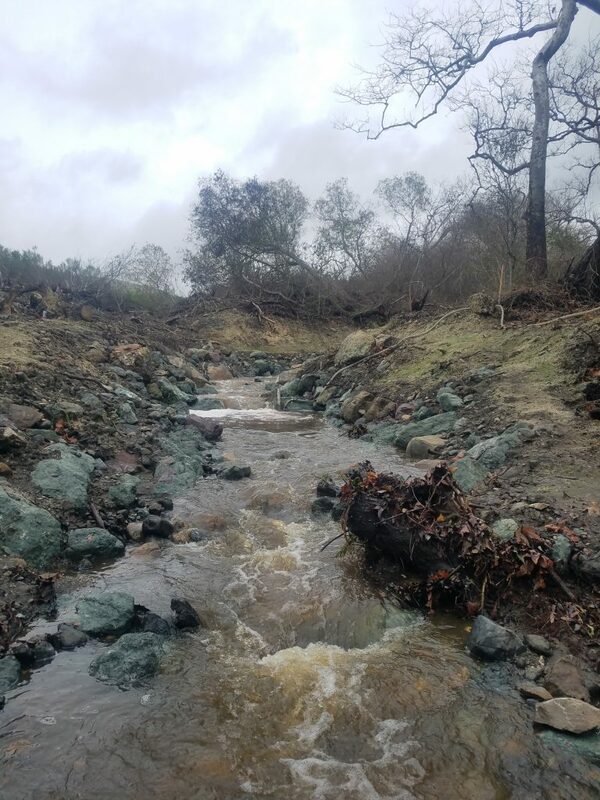 For 2019, we are focusing our efforts on the suspended sediment station on Chorro Creek at Canet Road. Over the month, we received 5.22” of rain at the gauging station on Chorro Creek at Canet Road. This brings the total up to 8.95” for the current water year, and there is more heading out way this weekend (with high winds and chances of lightening). Enjoy some photos of the storms and creeks over the last month. 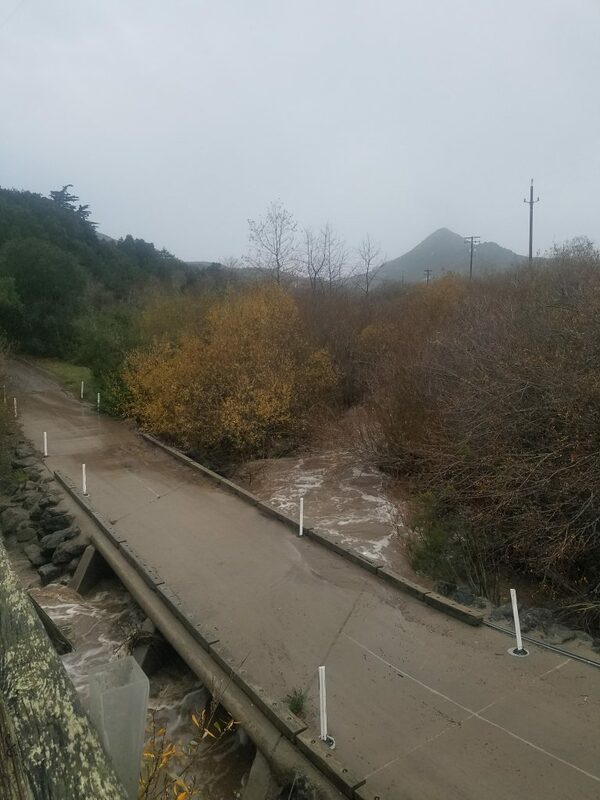 Chorro Creek reached 11.65ft at Canet Road – 0.45ft from crossing the bridge. Once the water levels dropped to safe wading levels, we went out to check on equipment and measure stream flow on Pennington Creek. This is at the site that previously had a fish passage barrier. The barrier was removed over the fall, opening up miles of Pennington Creek for migrating steelhead trout. Partners at other organizations have seen returning adult steelhead in a few other creeks in the county, so we are keeping our eyes open for ones in our watershed as well. Come see S.L.O.P.E.’s show Flowing Estuary to Living Sea, will hang at the Morro Bay State Park Natural History Museum between February 1 and March 31, 2019. A portion of the proceeds will benefit the Morro Bay National Estuary Program and the Central Coast State Parks Association. The opening reception will be held tomorrow, Saturday, February 2, from 1:00 to 4:00 p.m. We hope to see you there!